Does Guyana have a one-man political opposition? That’s the impression being given each time the parliamentary opposition holds a press conference at which Opposition Leader, Bharrat Jagdeo is the only representative. However, last week, Jagdeo made it clear that it is his prerogative and he will decide when he wants to share the spotlight. Jagdeo holds weekly press conferences where he speaks on a wide range of issues. In fact, he touches on all sectors and topical issues. To put things into perspective, the National Assembly is the main parliamentary forum. In the National Assembly, there is a government side and an opposition side. The government side consists of ministers and representatives of the various regions. The opposition side has its leader, shadow ministers and representatives of the various regions. When there is a Budget debate, each member makes contributions based on their portfolio, then for the opposition, its leader wraps up the debate. In that system all views are heard, each member is given an opportunity to speak. When there is a motion to be debated, suitable members on each side of the House make contributions. But, it seems as if occasions such as the aforementioned are the rare opportunities where the views of other opposition members can be made known. 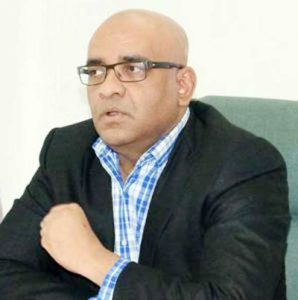 Jagdeo, as Opposition leader, holds weekly press conferences, but never has he allowed any other member of the opposition to sit with him at the head table. If there is a legal issue, Jagdeo speaks exclusively at the press conferences. This is despite the fact that Anil Nandlall is shadow Attorney General. In fact, only recently, Jagdeo attempted to explain the bearing that the CCJ ruling on presidential term limit will have on the GECOM case. If there is an issue in the Education system, Jagdeo speaks. This is despite the fact that former Minister of Education, Priya Manickchand has responsibility for this as Opposition MP. Two press conferences ago, Jagdeo spoke about an issue in the education system where the government wants teachers to become licensed. Jagdeo speaks on security despite the fact that Former Minister of Home Affairs, Clement Rohee has responsibility for that in Parliament. Just recently, he lamented that government still cannot get a handle on piracy and other crimes affecting the populace. Jagdeo also speaks exclusively at these press conferences on health matters, despite Frank Anthony being the Shadow Minister of Health, and so it goes with all other sectors. Last week, he spoke about drug shortages. In Kaieteur News’ coverage of Jagdeo’s press conferences, Members of Parliament have been observed many times lurking or observing the press conference through a transparent wall. Former Minister Juan Edghill was observed many times at the press conference and only last week, Manickchand was spotted on the premises as the press conference was in progress. Jagdeo does not even allow a moderator; he does that job himself. At his last press conference, Jagdeo was asked why no one else from the political opposition is represented. He was asked if he does not think PPP’s constituency deserves to hear from more than just him. He asked if this newspaper would like to make a suggestion as to who else should be represented at the presser. Sources within the PPP explained that various members, on many occasions, made themselves available and expressed willingness to speak at these press conferences.